Numbness and tingling (paresthesias) are unusual prickling sensations that can happen in any part of your body, but are generally noticed in hands, feet, arms and legs. Many things can cause the feeling of numbness and tingling, including sitting with your legs crossed or falling asleep on your arm. Patients may also describe the tingling sensation as a burning or itching feeling. The sensation of numbness and tingling can be caused by a sharp tap or bump on the elbow or knee or by keeping a limb in an awkward position, causing it to ‘fall sleep’, followed by tingling as the pressure is relieved. Numbness and tingling also occur as symptoms of a wide range of disorders, including nerve trauma and nerve compression. Chronic compression such as by spinal stenosis or a herniated/displaced disc often causes progressive numbness and tingling, as will chronic repetitive motion activities such as those leading to carpal tunnel syndrome. Numbness and tingling are characteristic of autoimmune nervous system diseases such as multiple sclerosis and may occur with seizures. Migraines may also cause numbness and tingling. 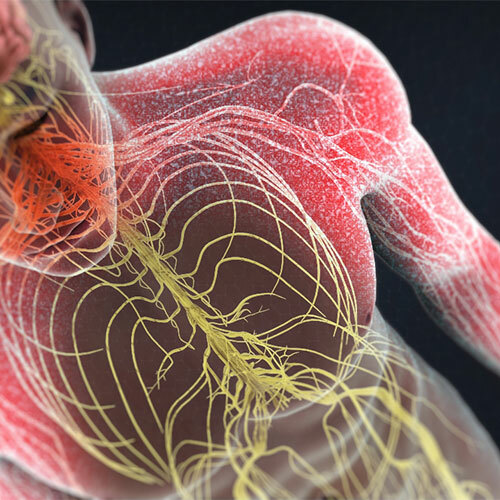 Numbness and tingling can be caused by vascular changes, such as arterial insufficiency or spasm, stroke, and transient ischemic attack and in response to cold (frostbite and Raynaud’s phenomenon). Other causes of numbness and tingling include metabolic diseases such as diabetes mellitus, hypothyroidism, vitamin deficiencies (e.g.,B12), and mineral/electrolyte imbalance. Toxins and poisons, including those entering the bloodstream via animal or insect bites, may have numbness and tingling as a characteristic symptom. Numbness and tingling also occur with some infections involving spinal nerves, such as shingles, and are known side effects of certain medications and chemotherapy drugs and of chemicals such as alcohol and nicotine. Radiation therapy has also been known to cause numbness and tingling. How is Numbness and Tingling Diagnosed and Treated? The key to diagnosing the cause of numbness and tingling is to obtain a thorough medical history and physical examination and a complete picture of all symptoms and circumstances leading to numbness and tingling. Imaging may include CT, MRI, and X-rays or vascular studies of the affected areas. Other tests include blood evaluations, lumbar puncture, and nerve studies. Sudden onset of severe symptoms calls for immediate attention so that conditions such as stroke, trauma, and compression leading to paralysis or loss of bowel or bladder control receive immediate treatment. Metabolic diseases, infections, and toxicities also need to be diagnosed and appropriate treatment started as soon as possible. The treatment plan for any condition causing numbness and tingling should also include physical measures such as exercises to help relieve abnormal sensations and restore or maintain function. Treating numbness and tingling may make the symptoms go away or stop them from getting worse. In some cases, numbness, tingling or burning can indicate a serious injury or medical condition. The doctors at the Florida Spine Institute are committed to finding the cause your numbness or tingling and discuss with you the best way to treat it.